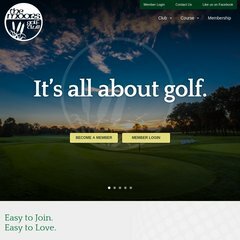 Topics: Golf Hub, Grille Room, and Outings & Meetings. On average 5.00 pages are viewed each, by the estimated 19 daily visitors. The programming language environment is ASP.NET. Its 2 nameservers are ns1.secantnet.net, and ns2.secantnet.net. It is hosted by Secant Technologies (Michigan, Kalamazoo,) using Microsoft-IIS/6 web server. PING www. (216.250.146.65) 56(84) bytes of data. A ping to the server is timed at 74.7 ms.